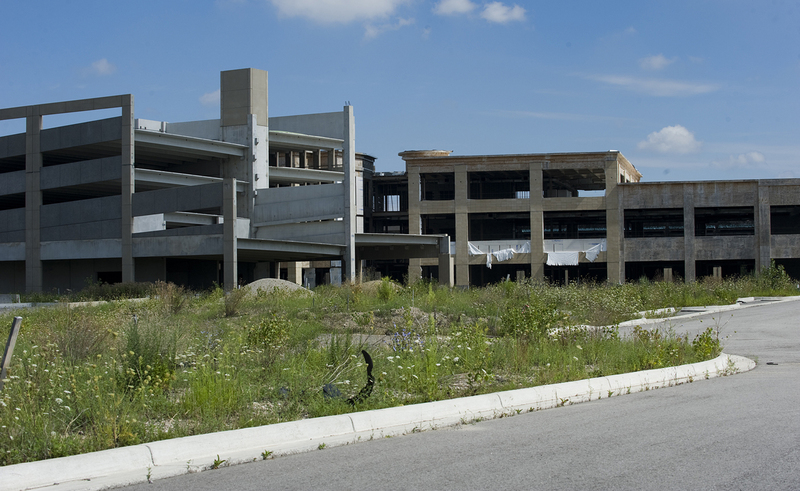 Bloomfield Park, an abandoned mixed-use real estate project in Oakland County, stands as an eerie symbol of the construction industry’s collapse in Michigan over the past decade. Looking like the bleak setting of a “Mad Max” movie, the planned $2 billion development on Telegraph Road just north of Square Lake Road was to have featured 1.5 million square feet of retail and commercial space and as many as 1,500 homes. But the gargantuan project collapsed in 2008, the result of an overly ambitious vision, shaky financing and Michigan’s plunge into a deep recession. Bloomfield Park’s partially completed, deteriorating buildings, some of which are seven stories tall, still remain. No one has come up with what Oakland County Executive L. Brooks Patterson has estimated would be the hundreds of millions of dollars needed to tear them down and haul away the rubble. No Michigan industry fell further over the past 10 years than construction, according to an analysis of gross domestic product data by Bridge Magazine. In 2000, construction was a $23 billion industry, representing 6.2 percent of the state’s $371 billion economy, according to federal Bureau of Economic Analysis data. But by 2010 construction’s output had dropped to just $9.5 billion, comprising 2.8 percent of $345 billion in state GDP. Construction’s GDP plunged 57 percent between 2000 and 2010, compared to manufacturing’s 16 percent decline. “Those were the worst years ever for building in Michigan,” said Bob Filka, chief executive officer of the Michigan Association of Home Builders. There are some positive signs for construction, though, as Michigan emerges from its lost decade. Home and apartment building permits in a nine-county Southeast Michigan region were up 22 percent for the first seven months of the year, according to Housing Consultants Inc. in Clarkston. The home builders association had 10,000 members when Filka, a former economic development official in Gov. John Engler’s administration, joined the group in 2006. Today just under 5,000 members remain. “The industry has been decimated,” Filka said. Residential construction is a wildly cyclical industry that’s tied to the ups and downs of the state’s auto industry, he said. But the worst downturn since the Great Depression and a banking crisis that is still making mortgages and construction loans tough to get have gutted construction. In a good year, about 25,000 new homes are built in Michigan, Filka said. This year, his association is forecasting between 8,000 and 9,000 homes will be completed. “We’re looking at 2020 before we see anything close to normal,” Filka said. Home builders who swore they would never do remodeling have entered that business in order to survive, he added. Carrigan said thousands of skilled trades workers left Michigan during the past decade, searching for work in other parts of the country. No one is predicting the decade-long bust in Michigan will be followed by another boom anytime soon, although there are encouraging signs for moderate growth. Michigan posted the third-highest percentage growth in the construction jobs in the country over the past 12 months, according to a new report by the Associated General Contractors of America. The state added 9,600 jobs in the period, up 8 percent from the previous 12 months. North Dakota ranked first at 19 percent. AGC economist Ken Simonson said much of Michigan’s boost in construction was tied to the auto industry as resurgent automakers and suppliers retooled and expanded factories. Tempering that progress, state and local budget cuts will hamper the growth of government-financed construction projects, Simonson said. “Public construction doesn’t have a very bright outlook over the next few years,” he said. I think a lot of these projects were ill conceived in the first place, and were based on wishful thinking. How much retailing can any one area support? With the lull in construction, it's a good time for community planners to re-think how communities should be developed. Oakland County is a mess, traffic snarls, no public transportation, and little shopping in neighborhoods. Everybody has to drive everywhere. Some new thinking is needed.